While there’s no substitute for the work of a good luthier, it’s a good idea to understand the basics of guitar setup. That will help you understand how to care for your guitar, what problems you can address at home, and when you need the help of a guitar repairperson. You can probably recognize excessive curvature in your guitar neck just by looking at it. If you hold the guitar from the body, without touching the neck, and sight down the neck with one eye, you will see if it is straight or not. If the neck has some relief, the middle string height will start low in the open position, be a bit higher along the middle frets and then get low again by the XIIth fret. The truss rod is often adjusted by inserting a wrench through the soundhole. When all six strings are tuned to concert pitch, their combined force can easily exceed 100 pounds of tension. This force would naturally bend the neck into a very large forward bow, much like a hunting bow. To prevent this, a metal rod is installed inside of the guitar neck. This is called a truss rodA truss rod is a metal rod inside the neck of the guitar that provides backwards tension to counteract the forwards tension created by the strings. . The truss rodA truss rod is a metal rod inside the neck of the guitar that provides backwards tension to counteract the forwards tension created by the strings. is not set to a fixed amount of tension, but the tension can be adjusted by tightening a hex key at either the head or base of the neck. It is adjustable because the needed amount of tension may change over time, due to moisture content of the wood or what kind of strings are used. The neck should be totally straight, or have a slight amount of forward bow. This forward bow is called reliefRelief refers to a small amount of allowable forward bow in a guitar neck, which improves playability for some guitars under some circumstances. , because we relieve the counter-acting tension of the truss rodA truss rod is a metal rod inside the neck of the guitar that provides backwards tension to counteract the forwards tension created by the strings. and allow the strings to pull the neck forward—but only a tiny bit. Don’t be afraid to adjust your truss rod! The truss rod is not meant to be set once and forgotten, and nor is it considered a job only for experts. Most guitars ship with a truss rod key, and the player is supposed to be able to make adjustments as needed. If there is too much relief in your guitar neck, the string height along the middle frets V-XII will be very high. You can try to adjust the truss rod yourself. However, if you’ve never done this before, it’s great to try it on a cheap guitar first. If you adjust the truss rod too much, you might cause it to break. You should not adjust the trust rod by more than one or two full turns at a time. If the problem you are experiencing is not fixed after two or more full turns, then you should probably stop and ask an expert, or at least wait a day and try again. You should also not tighten the truss rod very tight. It should not have the same resistance as the nut on a car tire. It should turn fairly easily. If the resistance is a lot and it is becoming difficult to turn, you should probably stop. Do not add more torque. It is also best not to make too many sudden adjustments. You can try a quarter or half turn of the trust rod and then stop, wait and observe. You can repeat this process until you’ve found the right setting. After making your adjustment, sight down the neck again and see if it’s improved. Because they affect the shape of the wood, truss rod adjustments need a bit of time to sink in. Try doing a quarter or half-turn, and checking again the next day. Sometimes if a truss rod has been overtightened, or heavy strings are replaced with lighter strings, the neck will begin to have a slight backbow. This is never ideal because the guitar won’t play correctly with a back bow. The solution is to adjust the truss rod and add a bit more reliefRelief refers to a small amount of allowable forward bow in a guitar neck, which improves playability for some guitars under some circumstances. to the neck. What’s the ideal nut slot height? Guitars fresh from the factory rarely get this right. 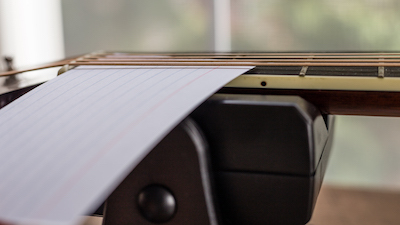 The strings of the guitar rest in slots or grooves that are carved into the nut, which is the small (often white-colored) piece by the guitar’s head, where the strings rest before branching off to the tuning machines. Because guitars are mass-manufactured, and because getting the correct depth for the nut slot is very difficult and exacting work, most guitars do not ship from the factory with perfect nut slot depth. What if the nut slot depth is wrong? If the nut slot is too deep, you will notice immediately because when you play that string open, it will rattle against the first fret. There will be a tinny metallic buzz whenever you play the string open. But if you play any other fretted note on such a string, there is no buzz. This is the tell-tale sign of a nut slot that has been carved too deep. The string should barely clear over the first fret, with very minimal clearance. Only enough to prevent buzzing. This one is a little bit too high. If, on the other hand, the nut slot is not deep enough—a much more common situation—it will not be immediately obvious to you. The consequence of this is that the strings are much higher than they need to be over the first fret, which means it will take more force than necessary to depress them in the open position. In other words, because most manufacturers do not ship their guitars with perfect nut slot depth, it may sometimes be difficult to finger open chords on mass-produced guitars. The irony is that this happens more on “cheap” guitars (less than $1500), so it’s usually beginners who suffer the most from this. And they’re the ones most in need of an easy-to-play guitar! A guitar that has gotten overly dry may have lower action, and thus have the rattling described above. It is best to first get the instrument fully hydrated before deciding if any setup work needs to be done. 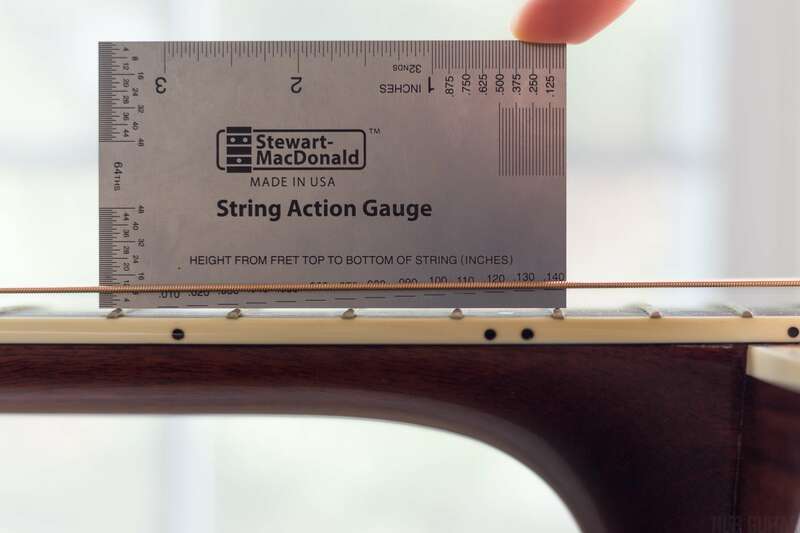 Guitar technicians measure nut slot depth settings by using a measurement which is equivalent to the distance from the bottom of the string to the top of the first fret wire. This height is measured in thousandths of an inch. It can be a very tiny amount of distance, especially for the high E string. The high E string is a mere few thousandths of an inch above the fret wire. The optimal nut slot depth is as follows: the string should rest as low as possible without producing any rattle or other problems. This would probably be about .010 inches (one hundredth of an inch, or .25mm) of distance between each string and the first fret. Very few guitars are set up to this exacting standard. A measurement of .020 inches or .5mm would be far too high—and yet, this is a common sight on new guitars. 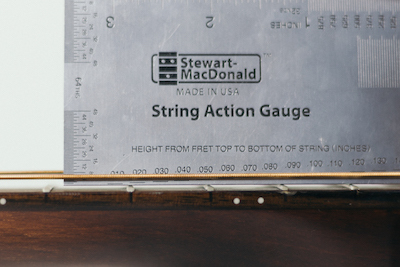 To know for sure, you’ll need to buy an action gauge, such as the Stew Mac Action Ruler[? ]Affiliate Link This small tool can be found on Amazon for a few dollars and every guitar player should own one! You can also buy a much cheaper one: Baroque Action Ruler[? ]Affiliate Link. If you suspect your nut slots need adjustment, this job is best left to an expert. Of course you can learn how, but it requires patience, some experience, and special tools. Some particularly cheap instruments are shipped this way. That is, if you grasp the guitar neck with your thumb and index finger, and slide your hand up and down the neck, you will feel the sharp sensation of frets protruding from the side of the guitar neck and scratching your hand ever so slightly. This is far from ideal. You need a smooth surface in order to play the guitar comfortably. This happens because frets are hammered in roughly and not smoothed out with a fret file. It can also happen due to humidity and temperature changes that cause the wood to contract. The metal fret wire, of course, does not fluctuate as much. Due to superior construction and wood treatment methods, you won’t often see protruding frets on a high end instrument. This problem can be fixed relatively easily by filing those frets until they are smooth and no longer protruding. This is also not much of a do-it-yourself task; you'd have to cover all of the neck’s wood with blue painter’s tape, and use special filing tools to dress the ends. When shopping for guitars, carefully-dressed frets are one tell-tale sign of good craftsmanship. An ideal string height is between .070 and .090 inches above the 12th fret. On this guitar, it’s over .140. 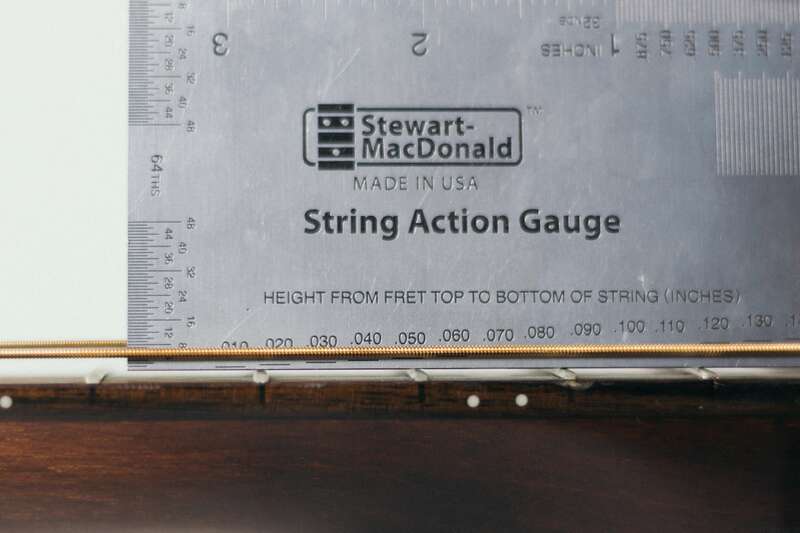 The term action describes the height of the strings above the guitar frets. If the action is too high, the strings will be unnecessarily hard to push down to the frets. If the action is too low, then the strings will rattle against one or more of the frets as they are played. Because the strings and the guitar neck do not follow a straight parallel line, this problem is sometimes more apparent on one part of the guitar neck and the other. Some players prefer a very low action. With a light touch, much of the buzzing can be avoided. To a point. This is especially true for quality instruments. Guitars crafted carefully with excellent fretwork are much more tolerant of low action than inexpensive guitars with hastily installed frets. If the action of a guitar is too high (which is the most common scenario) then the guitar will play fine, except that it will be harder to push down on the strings. The higher the action, the harder it is to play. Most new guitars start with action that is too high. 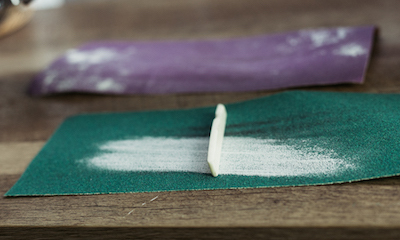 Lowering the guitar’s action can be done at home fairly easily with a little bit of sandpaper and patience. Be sure the finished saddle sits flat on its bottom edge, unlike this one that was sanded into a slope and now leans to the left. This is simple enough that a novice can probably address it at home. You’ll need to take off the strings and remove your saddleThe small ivory or cream colored piece of the guitar, mounted on the bridge, on the body of the guitar. This is the part on which the tightened strings rest, and are elevated above the body of the guitar. . Then, using some medium-grit sandpaper such as 200, sit the saddle on top, facing up as it had been when installed on the guitar, and shave off some of the bottom by pushing down and moving the sandpaper in a back-and-forth motion. Take off a tiny amount: about the width of the line drawn by an ordinary pencil. Now rest the saddle on a flat surface and make sure you haven’t filed a slope into it. If you have, keep working until you’ve got it flat. Reinstall it and string the guitar up. The beautiful thing? If you mess up and sand too low, you can easily shim the saddle back up. Tip: Using a Stew Mac Action Ruler[? ]Affiliate Link, measure the string action of the big E string at Fret XII both before and after. This will help you figure out if you’ve made an improvement. Most guitars can’t go much lower than .070" at the 12th fret. Sometimes an over-zealous action adjustment can result in a string height that is too low. Especially if it was done in the summer, with high heat and humidity, and now the winter has set in. The lower humidity and heat will cause the wood of the instrument to shrink slightly, and will result in a noticeably lower string height. Every guitar is different, but most quality guitars can be adjusted to .070" or .080" action at the 12th fret (Big E String). Lower than that and you start to hear alot of buzz. Due to uneven frets and necks that are not perfectly flat and straight, alot of cheaper guitars have to have even higher action. This is very easy to fix, and you can do it yourself. Remove the strings, snip up a tiny piece of credit card or similar material to serve as a shim, and stick it under the saddle. Put the saddle back on and voila! higher string action. If it’s still not high enough, do it again—this time with two shims, or—better yet—a thicker shim material. Since shims are thought by some to affect tone quality, some guitar players even keep two saddles handy: a taller one for winter and a shorter one for summer. Over time, frets will wear down. This means that as you fret a note, you might hear some buzz when you play that note because the place where the string contacts the fret has worn itself into a groove. This problem does not affect beginners very often, because it is a direct result of playing a guitar that has been well-worn. Normally beginners start with a new instrument. However, if you bought a used instrument (or inherited one) then you might have this problem as well. The exacting work of installing perfect frets is hard to get perfectly right. If your guitar frets are not of 100% uniform height from Fret I to fret XII and beyond, you may have playability issues. This is easier for a luthier to address with a simple file and some painter’s tape, but it can be a little time consuming. A useful starting point for most guitar learners. The neck of the guitar should be as straight as possible, although a small amount of reliefRelief refers to a small amount of allowable forward bow in a guitar neck, which improves playability for some guitars under some circumstances. is acceptable. 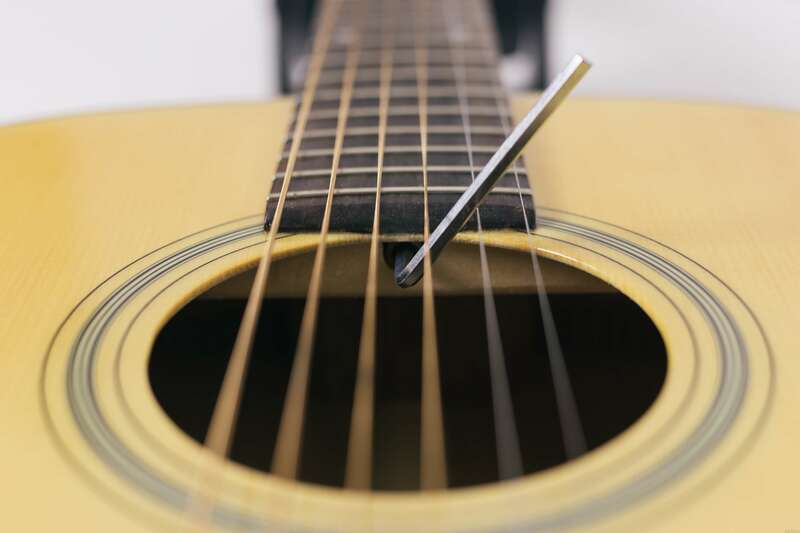 The point where the strings rest on the guitar nut and the point where the other end rests on the saddle should form a completely straight line as much as possible. The height of the strings from the neck of the guitar should be as low as possible without having any buzzing. The depth of the nut slots on the open string should be as low as possible without having any buzzing. No fret should be taller than the others, or have a rough, unpolished surface. No fret should protrude from the side of the neck in a way that scratches your hand as you play. The nut should not have any sharp edges that scratch your hand as you play. The strings should be a lighter gauge. 12 is the standard gauge for acoustic guitars, but many beginners will benefit from switching to 11’s or even 10’s. This is less important for electric guitars, for which 10 is a fairly standard gauge.